The week of July 22nd through the 28th, was particularly busy for the Ohio Soy Sustainable Summer county fair tour. We started out the week in Knox County, where we met Larry Hall, a 4H Youth Development Educator with the Knox County Extension office. Larry has dedicated his life to educating Ohio’s youth about agriculture, leadership, and conservation. He told us about the fundraising campaign he is helping to organize so that the Knox County fairgrounds can build an expansion to be used as a teaching area for conservation and agricultural education. The next day, we traveled south-west to the Clermont County Fair. We set up our activities near the center of the fairgrounds where we were surrounded by food vendors. As soon as we began our activities, food truck proprietors began to gather around our tent to see what we had to offer. After explaining what biobased products were, we showed them some examples of biobased food packaging and cleaning products. Many of the food vendors were excited to learn about the biobased alternatives to the products they use every day. On Wednesday of that week, we drove to the Clark County Fair, where we spoke with several commercial soybean producers. Clark County is home to many farmers, who produce agricultural commodities such as corn, soybeans, and pork. The fairgrounds were as booming as the agriculture industry is in Clark County. We parked the Sustainable World Tour van in front of the Mercantile building, and talked with fairgoers about biobased products and the variety of feedstocks that are used to create these products. The last stop on the Ohio Soy Sustainable Summer county fair tour this week was Preble County. We were graciously invited to participate in the Preble County Fair parade on Saturday. The parade starts north of the fairgrounds, and travels through the streets of Eaton before ending at the fair grandstands. The Sustainable World Tour van won 2nd place in the decorated float contest! 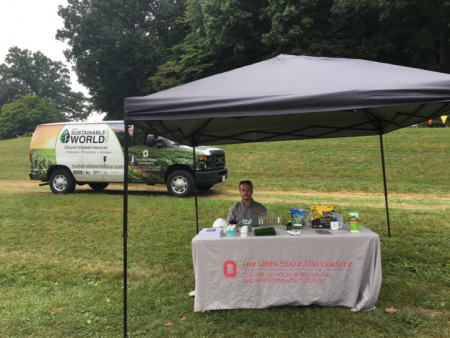 After the parade, we parked the van outside of the rabbit barn, and talked to the residents of Preble County about how they can live a more sustainable lifestyle through the use of biobased products.